SHARING THE LOVE FROM CYBER SPACE! I have lots of fun in store this afternoon with yet another feast with friends and the football Border Battle of OSU vs. U of M, so I am up early to "take care of business" before pleasure! Tate over at Ink N Little Things created the free promotional banner I am using on my Facebook page to help we sellers get the word out on the big CYBER SALE coming up this Monday and Tuesday, Dec. 2nd & 3rd! I just discovered her clip art store and blog, and am so grateful for her wonderful graphics and digital papers! They have helped me make my new line of classroom materials more colorful and creative! My own tPt shopping cart is currently full of her cute little polar bear/penguin and polka dot background packs!! 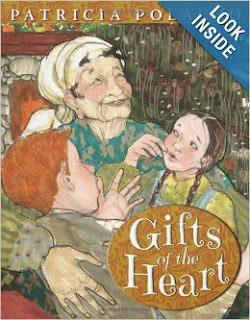 In celebration of my first store sale and the upcoming holiday, I uploaded a mini-unit based on Patricia Polacco's newest book, Gifts of the Heart. This true story of how she and her brother, Richie, learned an important life lesson is a perfect reminder to students that "'tis the season" to be giving of themselves, their time, and their talent. It's message of "kindness costs nothing and reveals rich rewards" will help students make powerful text connections and realize what simple things they can do to help others and spread happiness. Click on the link below to download this FREEBIE from my store today! A new blogging friend over at Primary World is hosting a Linky Party to promote all things gingerbread! Check out this tasty collection of learning materials that I've included my A GINGERBREAD HOUSE FOR A MOUSE in! It includes lots of creative ideas to help children use time-order words, make lists, and use descriptive language to describe story characters! May the rest of your holiday weekend be merry, bright, and restful!